CONCORD, N.C. – Marcus Gronholm has figured out how to keep 2,600-pound, 325-horsepower cars from sailing off of claustrophobic forested roads and from drifting off of gravel mountain switchbacks, but he’s having a tough time understanding American racing fans. Gronholm, a former FIA World Rally Championship superstar, just drops his head and shakes it side-to-side when asked why a form of racing which has captivated the rest of the world is virtually unknown in the United States. The WRC would appear to offer things that American fans love. Foremost, action. The cars – currently; Citroen’s, Ford Fiestas and Mini Coopers – freakin’ go. And, they wreck often and they wreck spectacularly as they attempt to navigate dirt back lanes, snow-packed mountain passes and dune strewn desert hardpan. The skills of competitors like Gronholm, Sebastien Loeb, Colin McRae and Tommi Makinen, many think, qualify them to be considered the best drivers in the world. “Just a different culture here,” Gronholm said, still pondering the WRC’s lack of interest in the States. America’s best-known rally-like event has been the Pikes Peak hill climb in Colorado. Many of the cars and stars from the WRC have climbed the peak in the past – including Gronholm in 2009. He finished second. Gronholm does understand that Americans have different ideas about watching races. “In rally, you have to travel, go to the next stage, the next stage, the next stage. Here, you sit there, you take your beer, you have your hot dog. It’s much easier,” he said. 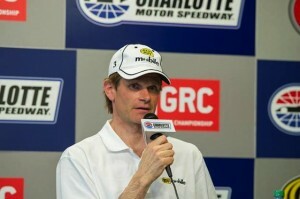 Which brings up the reason why Gronholm was sitting in the infield at Charlotte Motor Speedway on Friday afternoon. Gronholm now drives in the Global RallyCross Championship. The series uses cars that are similar to those used in the WRC and races them over enclosed, closed-course circuits which are jerry rigged at stadiums and, well, Charlotte Motor Speedway. At CMS, the circuit will include the front stretch of the NASCAR oval, the pit road and portions of the Legends oval. Jumps and water boxes will be built. Gronholm thinks that rallycross will be appealing to Americans. First, because it is easier to view and also because of the increasing popularity of hot hatches and European tuner cars on which the rally cars are based. 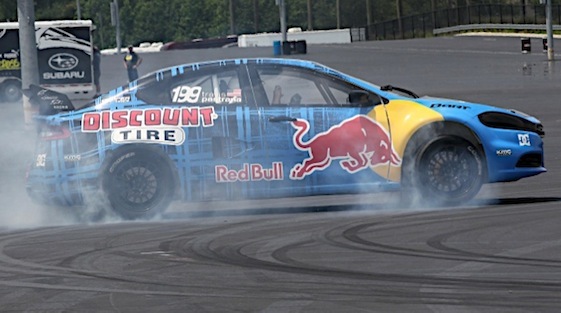 Racing against Gronholm at CMS will be American action sports star and, now, NASCAR driver Travis Pastrana. Also competing will be Tanner Foust, an X-Games drifter and rally driver, and former American WRC driver Ken Block. While much of what the RallyCross sport is like is foreign to NASCAR fans, it is not foreign to NASCAR drivers. Carl Edwards, Jimmie Johnson and Jeff Gordon have all driven in the Race of Champions – a series of stadium races held in Europe which features drivers from such series as Formula 1, WRC, touring cars and Sprint Cup. One year, Gordon was driving a course with Gronholm. Gronholm was behind the wheel and Gordon was “co-driving” when Gordon found out why action sports are called action sports. The GRC event at CMS is scheduled for Friday evening. Gronholm says if you go, you’ll like it.